Windy Weather Fishing Miami… we survived our first Hurricane scare of the year. We got hit by Hurricane Mathew, but Windy Weather Fishing Miami the worst of the weather missed us by about sixty miles. As soon as the hurricane passed by us to the north, our first “Winter” type “North Easter” moved in. We have had a full week of rough seas and high winds. Every year in October we get this “Nor Easter” for a week or so. It’s a good thing. It gets the winter fish like Sailfish, Kingfish, Bluefish, Spanish Mackerel, Amberjacks and many others migrating south through our area. 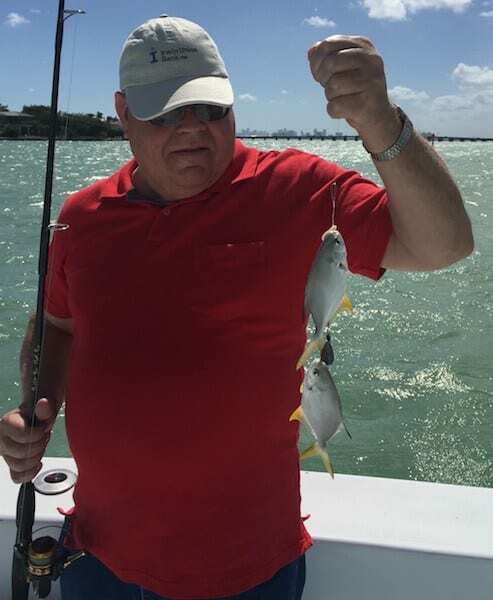 A few of our groups with kids or seniors that did not want the high seas adventure chose to fish for smaller, but action packed fish in the bay. Lot’s of wind but calm waters brought us action with Tarpon, Lane Snappers, Pompano, Bluefish, Jacks and assorted small bottom fish. We know winter is just around the corner. We found steady action with Bluefish and small Pompano. Using six pound spinning tackle and a combination of cut bait and shrimp put our anglers on steady action. We also cast netted a bunch of Finger Mullet. The Bluefish bites were steady on the live mullet. We also caught a few Jack Caravelle’s and Tarpon on the Finger Mullet.